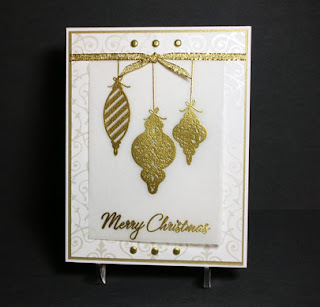 There are only three spots remaining in the Christmas Gold card class on Sunday, Dec. 6th! If you want me to hold a seat for you, please let me know by Nov. 29th. The fee is $15.00, and includes enough materials to make six cards (choice of white Bride Specialty Paper or cream Bridesmaid Specialty Paper), refreshments, and an illustrated instruction sheet for future reference. These are wonderful. I wishI could come to your class but I live in southeast MO and it just wouldn't work. Oh well. Have fun.